Bracelets are often our best choice for a Mother’s gift. Finding just the right piece of jewelry for your mother is not always easy. For Mother’s Day, Christmas or even birthdays, we want something unique and a gift they will love. We want to find a piece of jewelry that will be the first thing they reach for when they are selecting their accessories for the day. Therefore, whatever we choose, needs to be versatile and accommodate many different fashion choices. Charm bracelets make the perfect choice for all of these concerns since they can be worn with a variety of styles and colors. The charm bracelets featured in this article are unique creations offered by Blackberry Designs Jewelry on Etsy. My son purchased a bracelet from that store for his grandmother for Christmas. We all love that bracelet! The bracelet creations by Blackberry Designs Jewelry are simply fabulous. They are unique and quite beautiful. Because they are made with quality materials, we never have to worry that they will turn colors or flake. That alone makes them well worth the investment. 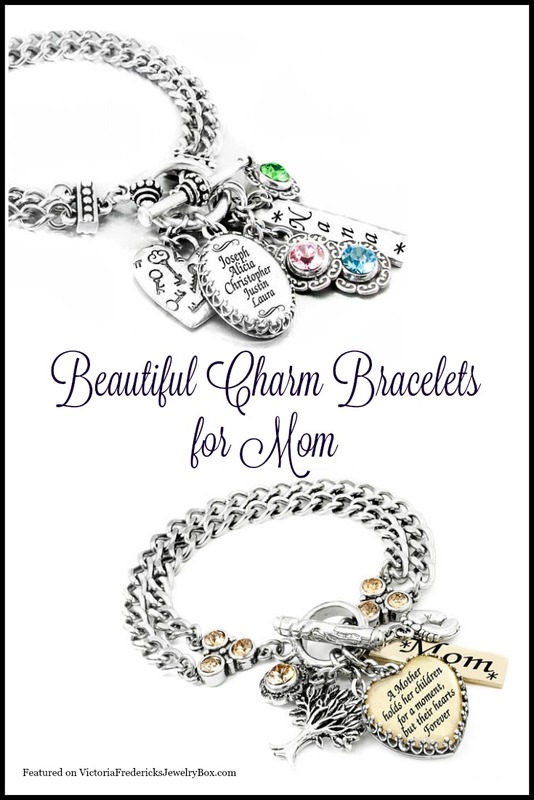 However, the charms are also beautiful, which makes these bracelets the perfect gift for moms. I absolutely love the featured quote charm on this bracelet: “A mother holds her children for a moment, but their hearts forever”. Every mother knows the truth of that statement, and I believe every child does too. 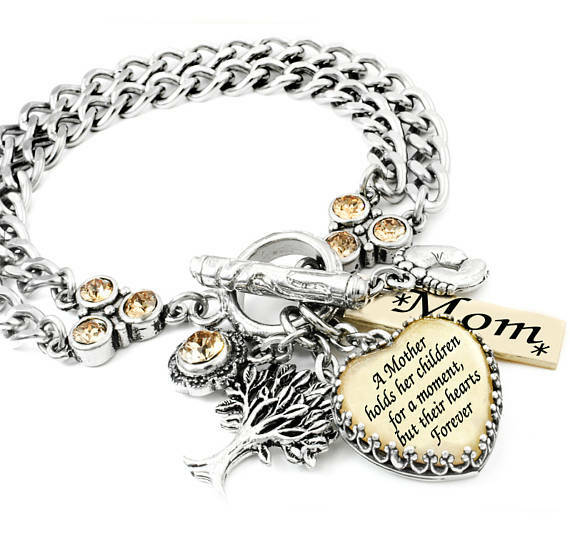 This bracelet is personalized just for your mother. 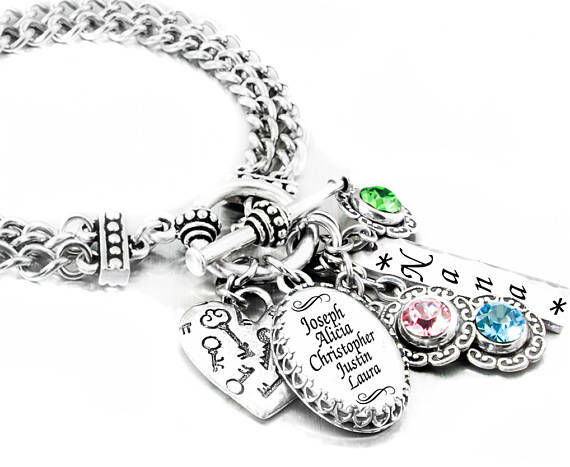 The largest charm features the names of her children. You choose the color of the crystal chatons at the time of your purchase. 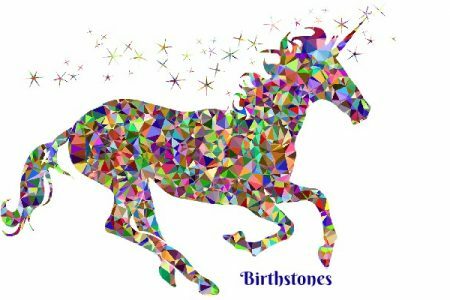 Any mother would love to have her children’s birthstone colors alongside their names. Either of these bracelets would be a lovely gift for a mother. It would be a gift that is sure to be cherished for her entire life. 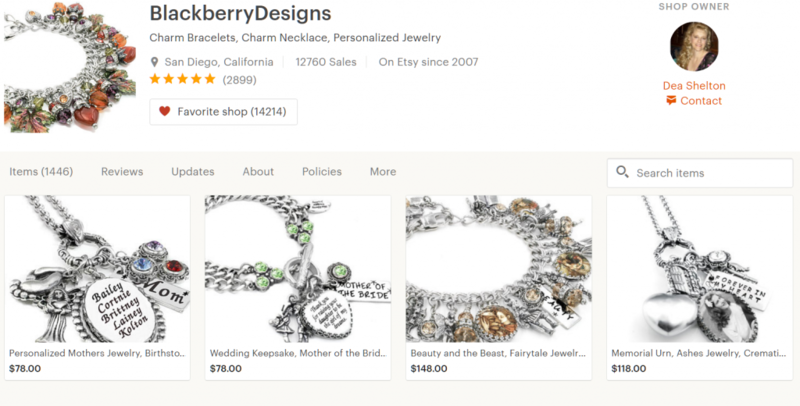 Blackberry Designs on Etsy has several other bracelets for mothers available in her store, as well as unique and personalized necklaces for mom. I recommend stopping by there today to make your selection. Whichever you choose will be a gift you will be proud to give your mother. My mother’s charm bracelet was her very favorite piece of jewelry. It’s probably the most versatile piece of jewelry any woman could own, because it ends up being uniquely individual, reflecting her own children and family and special interests. You have selected some lovely ones to showcase, especially for Mother’s Day gift ideas. I love my charm bracelets. I have 2, one in Yellow Gold, and one in Silver and I sometimes wear them both at one time. LOL My granddaughter loves the sound they make and I love all those memories on them.